The PNC Arts Center in Holmdel, New Jersey is a popular venue for summertime concerts at the Jersey Shore in Monmouth County. 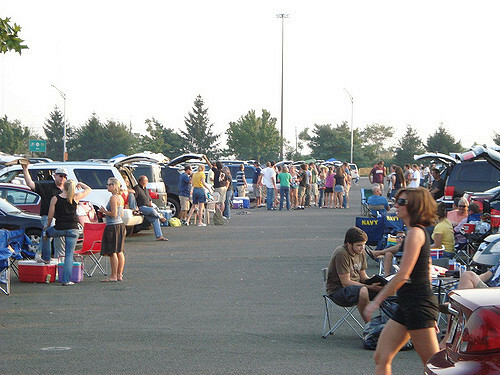 Thousands of patrons attend performances each summer, and on concert days, tailgating is common. This year’s lineup includes acts such as Dierks Bentley, John Fogerty, ZZ Top, Slayer, Imagine Dragons, Rascal Flatts, Steely Dan, the Doobie Brothers, the Vans Warped Tour, the Dave Matthews Band, Rob Zombie, Marilyn Manson, Kesha, Macklemore, The Cult, Lauryn Hill, Pentatonix, Deep Purple, Judas Priest, Ozzy Osbourne, Willie Nelson, Niall Horan, and Kevin Hart, among others. As the crowds gather at the PNC, so do arrests – for underage drinking, possession of marijuana, assault, driving under the influence, possession of drugs, public urination, possession of drugs in a motor vehicle, and traffic violations. Think twice between carrying an open container in the parking lot or smoking marijuana before the show, or risk arrest by the undercover State Police at the PNC Arts Center. Recently, the NJ criminal and traffic defense lawyers of Schwartz & Posnock obtained the dismissal of driving while suspended charges against a client in the Woodbridge, New Jersey Municipal Court. Had the client been convicted of these charges, she would have faced a mandatory ten days in jail. She would have also faced further license suspension and fines of $750.00 and $1,000.00 respectively. She would have lost her job, and her family would have been subjected to significant hardship. United States Justice Department Creates New In-House Team to Monitor Accuracy of Forensic Testimony in Criminal Cases. In recent years, the battle over “junk science” used in wrongful convictions has accelerated. For example, the Innocence Project at the Cardozo School of Law in New York City found that forensic evidence was misused in nearly half of the 350 cases in which DNA was used to help exonerate wrongly convicted defendants. Penalties for being charged with driving while intoxicated (DWI) or driving under the influence (DUI) in New Jersey are severe, including heavy fines and penalties, jail time, and license suspension. If you are charged for DWI, DUI, or a related offense in New Jersey you will need a criminal defense lawyer who is willing to utilize rigorous defense strategies to protect your future. Schwartz & Posnock Attorneys are experienced NJ criminal defense attorneys who have a strong track record of defending clients charged with these types of offenses in New Jersey. Navigating a federal criminal case can be daunting. Most individuals are unsure of what lies ahead — not just the ultimate result, but also the various stages that are a part of the process. An experienced NJ federal criminal defense attorney is essential to understanding this complex procedure. Below, you will find the order of events described briefly. The NJ criminal lawyers of Schwartz & Posnock achieved a major victory in the Morris County and Essex County Superior Courts, which will not only protect society, but will also drastically improve an individual client’s quality of life, health, and well-being. Our client was charged with 3 first degree crimes, worth potentially 60 total years in prison, after attempting to rob three banks in two counties. The defendant was a college student with no prior criminal record and extensive family support who, unfortunately, struggled with a severe heroin addiction. After presenting our client’s comprehensive background and addiction history to the judge, our client’s cases were consolidated, and he was offered the opportunity to be placed on probation and attend Drug Court. Looking for a trial or appellate attorney who will fight for you every step of the way? For whom no detail is too small? Schwartz & Posnock is that law firm. A decision by the Appellate Division of the New Jersey Superior again demonstrates why you need experienced criminal defense counsel in your corner. Details of the case follow. Today, in an important case of first impression, State v. S.W., in New Jersey argued by Schwartz & Posnock, , the Appellate Division of the New Jersey Superior Court ruled that our client, a Municipal Court defendant, charged in two separate jurisdictions, could consolidate her cases in a single court for the purpose of obtaining a pre-trial diversion program. The state of New Jersey criminalizes the possession, sale, and distribution of prescription drugs (such as Xanax). Charges involving sales or distribution of drugs have tougher penalties than charges limited to possession for personal use. Felony consequences can include prison time and hefty fines. What many people fail to realize is that giving away your prescription drugs is illegal. It might seem okay to give your pills to a person in pain, however, prosecutors and law enforcement take a different viewpoint on this. Even if there is no money transaction involved, numerous state and federal laws make it illegal to share prescription medicine. Therefore, you don’t necessarily have to earn a profit to be charged with drug distribution in New Jersey.